The Noetics are a band that I discovered at the Swamp Room Happening in Hannover Germany back in April. They were the first band to play and what a surprise! The band are very young, with all members under 25, some under 20! They play a complex Ozrics influenced jazz rock. The synthesizer player was extremely good and the rhythm section very tight. This CD, of which they only played two songs off, is much more jazzy with a space rock element. The concert was more space rock with a jazz element. It will be interesting to see the future of this band. The CD starts off with perhaps the best track, "Styrophoam Peanuts". This song has a definite Ozrics style beginning but when the song gets going they go for the more 80's style Ozrics sound with the echoy guitar and etc. "Shroomin'" is next and is also appears as the last track in a remix version. This song is very jazzy, almost in a reggae or Latin style jazz, but starts with some very cool synth sounds. I think there is very strong playing by the members on this CD. "Phallus Fiction" is the bands instrumental funk style number. You can tell these guys had listened to a few jazz fusion records like Al Dimeola and John McLaughlin as the music shows the influence, but does not have the ripping guitar leads. The guitar player is quite modest. "D-Dope" also appears as a regular track and a remix and is the only track with programmed drums for part of the track and is more electronic in nature. "Wolfi's Dream" starts with a digieridoo or a sampled one and is a slow building track with layers of interesting things slowly emerging. Quite an interesting CD for those who like the Ozric Tentacles and a bit more jazzy style. 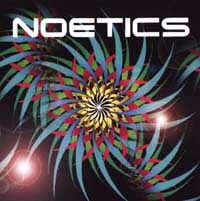 You can visit The Noetics at their web site.